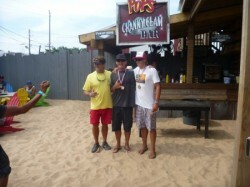 Jamie Mitchell has taken out the 2012 Long Beach 10 Miler SUP race, hosted by NY/NJ Paddle on Saturday. The 10x World Champ won the Elite 14′ class ahead of local Mark Temme with J.P. Foschi taking out the 12’6″ class. Meanwhile in the women’s race Stephanie Shideler dominated, beating home not just the other girls but also three quarters of the men as well. Check out the full race results below and get a complete race report over @ NYNJPaddle.com.